There is one great scene and another that’s at least charming in Hansol Jung’s play “Cardboard Piano,” now occupying the stage at TimeLine Theatre. 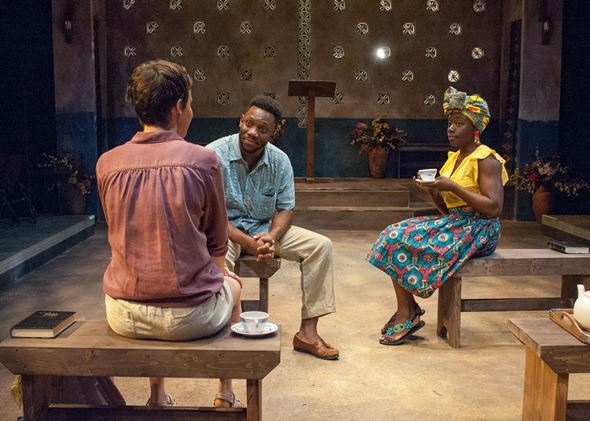 But all told, this dramatic parable about the intolerance of homosexuality in Uganda limps from adolescent fantasy to a second act that is more contrived than compelling. The launch point is the secret wedding ceremony of two very young girls, an Ugandan and the daughter of white American missionaries. Giggly, impulsive, defiant and desperate, these two starry-eyed kids have barely pledged their troth when into the church – run by the American girl’s parents – bursts a young fugitive from the perpetual war going on outside. He is seriously wounded. A threatening soldier (Kai A. Ealy) comes to the church looking for a wounded fugitive. I’ll get back round to the flimsy stuff that leads up to the wedding ceremony and the better stuff that comes from the encounter between the newlyweds and the bleeding and exhausted interloper. But first the part of the play that stands head and shoulders above the rest: On the heels of the fugitive youth comes a heavily armed solider, an older man, the boy’s master. The church is dark. The man is intent on discovering the boy; and though he waxes solicitous, calling out, entreating, he is clearly dangerous. 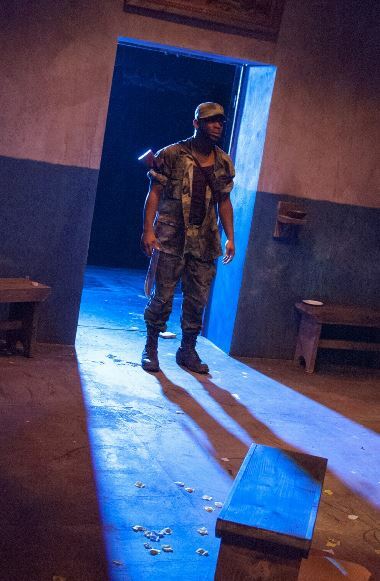 The soldier, invested by Kai A. Ealy with an aspect of long, hard experience in Uganda’s strife, confronts first the pretty Ugandan girl (Adia Alli) and only then the boy, his quarry. 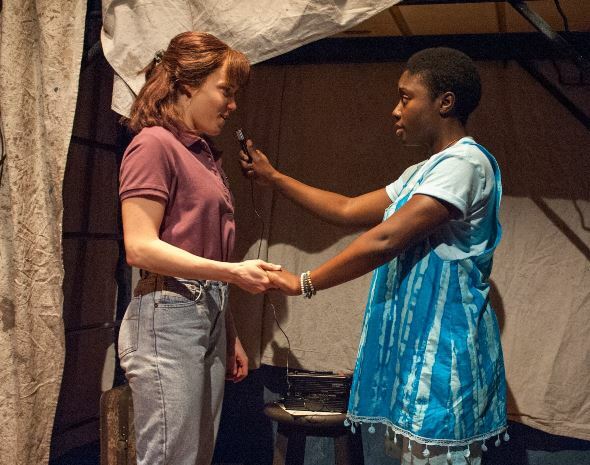 The grinding tension of the scene turns swiftly to violence, and then to revelation: For the first time, the fugitive boy (Freedom Martin in an empathic performance) comprehends that the two girls are lovers. He does not react well. Thus the opening act races to its finish in a more potent mode than the childish, treacly early going could portend. So back to that banal exposition: The Ugandan girl Adiel wants their wedding ceremony to go by the book, with formal vows. She is serious, clear-sighted; Alli makes her an appealing instigator, determined to observe nuptial tradition. The American girl, Christina (Kearstyn Keller), is all aflutter, unsure about the whole adventure, more petulant than articulate, downright juvenile compared with her beloved Adiel. The fraught wedding business had the look of a sixth-grade play; it was hard to know whether the vacuity of Christina’s character resided with the actor, the playwright or director Mechelle Moe. In any case, the sum of the three did not add up to much. Christina, now around 30 years old and returning to the church to honor her father, is welcomed by the pastor Paul (Kai A. Ealy) and his wife (Adia Alli). The second act is tricky to write about lest one give away its secrets. The time is 15 years later; the scene is the same church, where Christina has returned in hope of performing a rite on behalf of her deceased father. Now the pastor is a man called Paul (Kai A. Ealy in a new persona), who is married to Ruth (Adia Alli again as this older woman). Here we find pastor Paul rehearsing his sermon – a story about the Good Samaritan, who offers aid to a fallen man whom others have passed by with indifference. The preacher portrays the two negligent souls, then the helpful Samaritan. It’s a funny, delightful little tour de force by Ealy, whose acting prowess quite overshadows that of everyone else on stage. Which brings me back to Christina, in whom the passing of 15 years has brought neither conspicuous maturity nor notable depth of character. At any rate, Keller managed scarcely more range or nuance here than she did as a rebellious kid in Act I. In fairness, the playwright has very little to offer either Christina or the pastor’s wife, who mostly frets and flutters and repeats herself. Then there’s the play’s underlying leitmotif of homophobia, which is invoked with real pungency in Act 1 but feels heavy-handed and, well, preachy the second time around, as guilt and righteousness come to blows. The narrative ends in a stylized, choreographed, wholly unprepared peroration of sweetness and light. Designer Jeffrey D. Kmiec’s church lends the show an earthy texture, and Brandon Wardell’s lighting is essential to the palpable terror that rises in the form of the man-hunting soldier in Act I. The play itself, however, gives the impression of a work in progress: some good bones, but scant flesh.